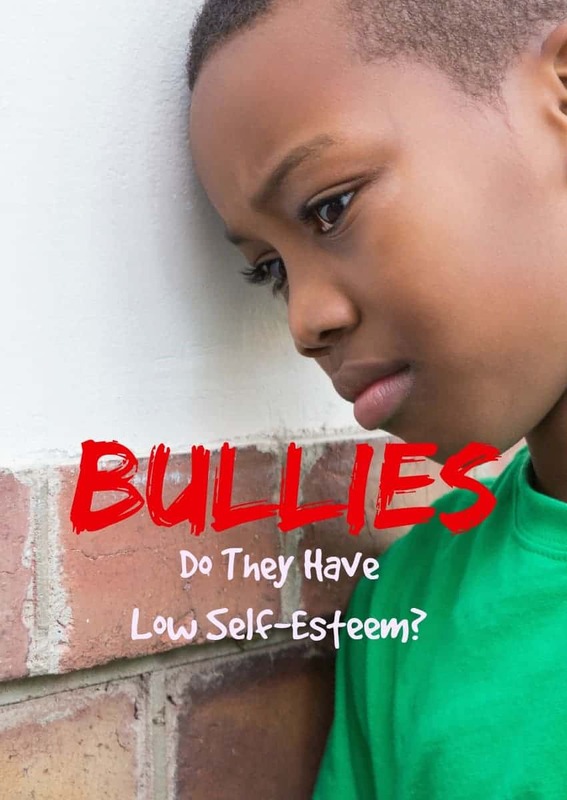 Bullies: Do They Have Low Self-Esteem? Do bullies have low self-esteem, is that why they treat others poorly? Bullying is intentionally making someone feel bad. Bullying comes in many different forms from physical to cyber, all with the purpose of making them feel bad. Bullies get some satisfaction out of seeing someone else hurt physically or emotionally. Or maybe they just don’t know how to treat people correctly? Keep reading, it may surprise you. Is it a need for attention? Just trying to be cool? Have you had to deal with bullies, whether it was you being bullied or your kids? How did you go about dealing with the situation? Share your stories and experiences with us below in the comments! This answer surprised me; I always thought that all bullies have low self-esteem, and that is why they act the way they do. It is just the opposite. Surprisingly, they feel pretty good about themselves. They think highly of themselves, and thus the reason for their poor behavior. Bullies think they are superior to everyone else. The reality is, according to the Center for Disease Control, bullies are more likely to experience violence at home. More often than not, a child is missing out on positive attention from his or her parent and is lashing out to get the attention he needs and wants. It doesn’t matter if it is good or bad attention; attention is attention. Kids are like giant sponges; they soak up what is around them and then act the same way. If a child is being bullied at home (angry parents, parents who constantly put their child down) that child is going to treat others the same way. Our parents are supposed to teach us the right way to act right? Well, if the parents are acting the right way, then the kids aren’t going to either. Sometimes kids bully to prevent themselves from being bullied. It is a defense mechanism in a way. They think if I am the bully, then I can’t be bullied. Being a kid is tough! I know when I was a kid, other kids thought it was cool to be mean to others. I was not one of those kids, it never made me feel right to be mean, I felt bad for those who were being bullied. Some kids want to be part of the popular crowd and think the way to get there is to be mean to and make fun of other kids. Sometimes there may not be any other underlying factor for a bully to bully other than he just wants to fit in. Whatever the reason is for a child to bully others, it is a behavior that can be changed. Kid’s behaviors are not set in stone, all it takes is a caring adult to help them see how their actions are hurting others. Deep down, they are probably hurting too. Let’s try to get to the root of the problem instead of simply punishing the bad behavior. Tired of the Daily Grind? Head to Mauritius Island! I spent most of my childhood afraid to go to school- I was a geek, much younger than my peers, and stuck out like a sore thumb. In my case, I think I was just an easy target. Thank you for this article! Too many people try to fix the problem without getting to the root. I think my favorite thought you wrote is that “Kid’s behaviors are not set in stone…” I have seen many adults say that so and so is a “bad kid” or so and so was just born with a negative or manipulative attitude, forgetting that children need to be molded! They can change! If the adults in their lives give up on them, why shouldn’t they give up too? Thank you again for these thoughts! Bullying is such as important issue. We need to arm our kids with the tools to help combat those bullies. This is a great question and topic for sure. I do believe bullies bully because they to have a love self esteem or because they are being bullied by others. They could be getting bullied by adults in their life.. I think sometimes bullying is a result of “Allowed” behavior. Kids might have a natural tendency to dominate and tease. You need to teach them meanness is not allowed. This is such a great topic for parents. It is important to understand what our kids are feeling and thinking and that is often times spelled out in their actions with others. It’s so important to instill good self-esteem in our kids! SOme parents may not know how to because they never had anyone instilling ‘good’ in them….sad! This is good information for those parents who don’t know where else to turn. I feel like once the problem is recognised the parents should do everything they can to correct it especially in this case. It could end really badly for everyone if the problem isn’t corrected. I think there are many things that lead to someone being a bully. Sometimes you need to go deeper and find out the root of the problem to really solve it. From my experience, bullies are usually bullied and/or mistreated at home. Bully is a learned behavior from what I have seen. Growing up kids were so cruel because I was different. I didn’t like the things they liked and prefered to spend time with my family than other kids who I did not have much in common with. Bullying has become so prevalent in today’s society and it really is so sad. I’ve just got to think that those who are mean and bully others do so because of their negative feelings that they have about themselves. I think that bullies lack self esteem and many other things that they crave for starting in their family. I always tell my kiddos that if someone if trying to make you feel bad, they may have bad feeling inside of them. I always ask them to pray for someone who may be a bully at school. What a great article. It’s so important to instill good self-esteem in our kids! I homeschool one of my boys and a deciding factor was this exact reason. He is very sensitive and emotional his last year in public school was a roller coaster of good and bad. I worried so much about him and the bullying that went on because of his emotional nature. I can imagine bullies are often going through a lot of pain too. It would be nice to see more schools handling bullying behavior with this in mind. I was bullied in school and I am praying my son does not. I hope that those that do bullies find what they need to fill that void. Either way it is a sad situation. I think bullying is a combination of all of these. Kids don’t get the attention that they need or if they do, they get the wrong kind. That leads them to act out towards others that they perceive to be weaker. I always want to look toward the parents of bullies. Did they not teach their kids how to act? Do they even know their kids are bullies? We teach our kids not to be bullies and what constitutes a bully. We teach our kids to stand up for each other. I think they have to. They learn this behavior somewhere and I assume it’s from their parents putting them down. I agree. In every situation I have seen with bullies it has to do a lot with their life at home.